As people, one of the most important things we can do for one another is live out the words of 1 Thessalonians 5:11 (ESV); “Therefore encourage one another and build one another up, just as you are doing.” I’m not talking about “blowing smoke” (false flattery) as many are apt to do today. Instead, we should genuinely offer wise counsel and encouraging words to help others in their journey. I’ve written winning proposals and contracts for over thirty-five years; receiving many accolades, bonuses, and awards. Nothing in my business writing career compares to when you see your name as a byline for the first time. Whether it’s a published article, devotional, or book, seeing your name in print stirs your soul. For me, the emotion is less one of pride and more of accomplishment. In my mind, I feel I have accomplished the task God has called me to do. I planted a seed to help someone find their way to a closer walk with God. Can anything be more important than that? I think not. I remind myself often that as a Christian writer, my job is to plant the seed; God brings the increase (1 Corinthians 3:7). We have opportunities each day to encourage others; be that a writer, carpenter, rancher, teacher, or taxi driver. Without question, my writing results from much encouragement these past few years. My writing friends, editors, publishers, and family have all encouraged me to learn and grow. To those who encourage me, I offer a heartfelt Thank You. To each of you reading this, I implore you to reach out in kindness and offer encouragement to someone you meet today. Encourage your son or daughter, a co-worker, or a friend who is struggling through a difficult day. We may never know who might benefit from a simple thing as a kind or encouraging word. As Christians, God calls us to be salt and light in this fallen world. When we send out the light of God into this world, more often than not we receive more of His light. One day, Christ will reward you for sharing His light in this world. Thank you Ms. Joyce. So very kind ma’am. We serve a good God don’t we ma’am. Ms. Karen; you sure know how to make a fella feel like a million bucks ma’am. Thank you so very much for this kind example of encouragement. What a blessing you are my friend. What an “encouraging” post! You are so right. 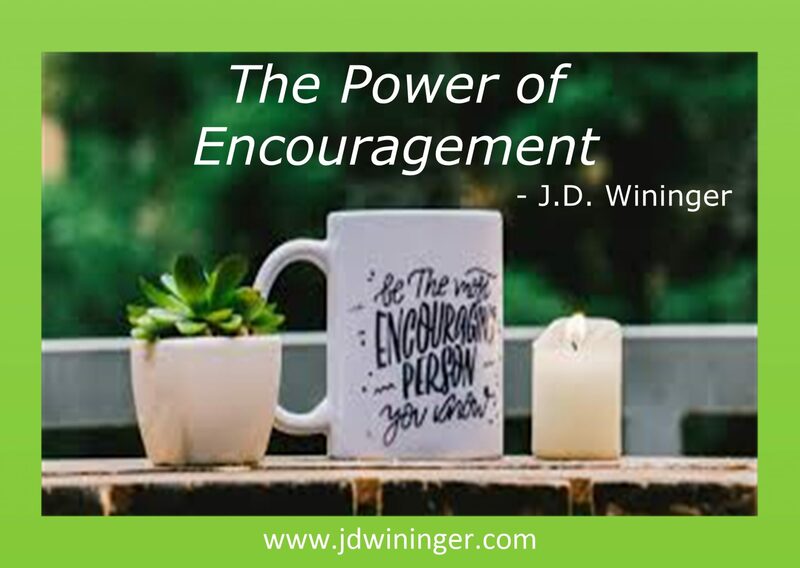 One never knows how a word of encouragement can boost a person’s entire day. Am learning from your example Ms. Beckie. God’s blessings ma’am. I had the opportunity to guest lecture (teach) in a Creative Writing class for 6th-8th graders today. I taught on editing. There were about 18 kids in various points in their story and it was fun to read and encourage them on great work. Aww Ms. Jackie, you and others here are too kind. We must simply give back all that we get in this life. If something I write or say can help someone else, it is repayment for earlier blessings given me. God’s blessings ma’am. Thank you for your kind words and continuing encouragement. Now that’s a real blessing to them Ms. Jackie. Thank you so much for sharing that uplifting story. You are a living example of The Power of Encouragement ma’am.